I received this sample in the hopes I would share my honest opinions. 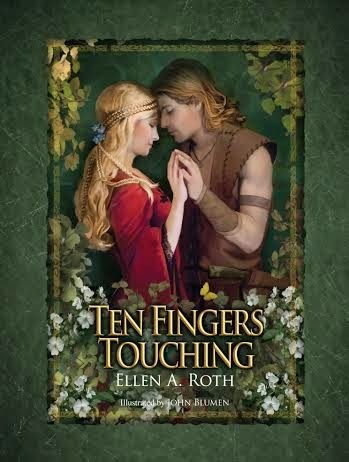 You are never too old for a fairytale especially one that spins a romantic tale, mystery and adventure the way Ellen A. Roth has in Ten Finger Touching. In Ten Finger Touching Roth spins a passionate fable of suspense and romance illustrated with lush paintings rendered in the highest fantasy tradition by renowned artist John Blumen. Together they weave a spellbinding story of two young lovers caught between the forces of good and evil, with the future of the kingdom and an innocent child’s life at stake. Can the young master of the forest and his beloved maiden save the kingdom and find their “happily ever after?” Fans of Once Upon a Time and The Princess Bride will be swept up in this story featuring the freshest new figures in romantic fantasy literature. I was immediately awed by the illustrations which are true works of art, they bring an visual element to the book that I have never seen in another. Even more impressing is that right now Amazon is offering Ten Finger Touching for only $8.63 shipped.